Finished in Worn Black with brown undertones on select hardwoods and veneers. 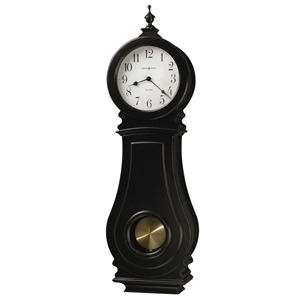 This wall clock features a turned finial and antique spun brass pendulum. Volume control, automatic nighttime volume reduction option, and automatic nighttime chime shut-off option. Requires two C sized batteries (not included).